When I was in school I remember getting gold stars for excelling or doing a great job on an assignment. While it isn’t anything major, it really helps with motivating students. I don’t know if anyone remembers the Book-it! program, where you had to read so many books, you would get a personal pizza at Pizza Hut. This program is probably the only reason I read books in middle school. Anyway, digital badges have been around for a few years’ now and are starting to gain popularity. They take these incentives and allows you to issue badges for learning. Below is a link from ISTE giving a good overview of how they can be great assessment tools, especially in eLearning. One digital badge site, Credly.com, allows you to incorporate digital badges in many social media outlets. 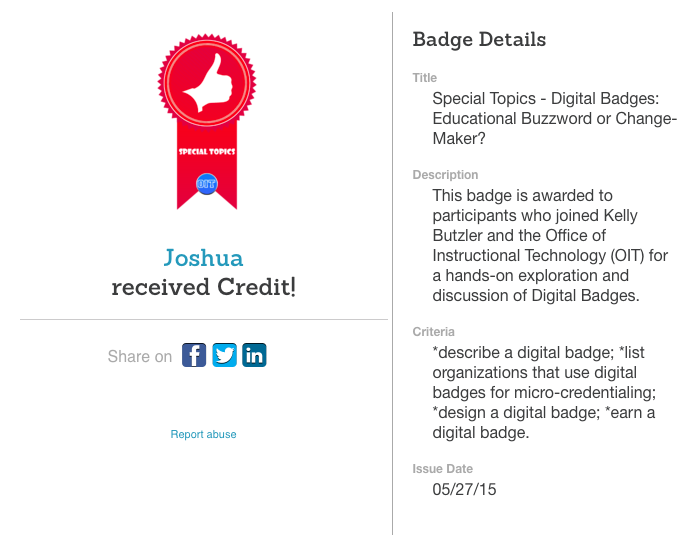 What does everyone think about using digital badges as a way to track learners progress? I have never heard of this before. I think it could potentially be a good idea, it makes learning almost like a game in my eyes. When I think of a game I think about you have to pass a certain level and in order to pass that level you have to earn things along the way. I’m not sure I would be interested in doing it as a student though. I personally like to learn at my own pace and if the teacher made it so everyone can see where everyone stands I would feel pressure to go faster just to catch up to others. I think using digital badges is a great way to track learner’s progress and most importantly it motivates the learners. I know as a young student, I would have loved the opportunity to earn and collect digital badges for completing various instructional tasks. This would have motivated me a lot more to learn “dry” material that often gets brushed off in elementary school and high school. As for the Book-it! program… Of course I remember this! This got my young-self, reading like a mad man! Very good comparison! Next Next post: Digital Technology – Replacing teachers?